Vol. 1, no. 1 (Apr. 19, 1860)-v. 1, no. 34 (Aug. 1, 1861). In April 1860, Joseph E. Johnson established the Huntsman’s Echo in Wood River Center, Buffalo County—the furthest west of any of Nebraska’s territorial papers. The paper’s motto was “Independent in Everything, Neutral in Nothing.” The Echo lived up to its name as Johnson was a florid and opinionated writer. He was strongly in favor of maintaining the Union and deeply disturbed by the idea of civil war, yet critical of the “Republican reign of terror.” In addition to running a newspaper and printing business in Wood River Center, Johnson and his family (he had two wives and many children) had a large outfitting company on the Mormon Trail. Called a “road ranche,” Johnson’s holdings included a farm for fresh vegetables and crops, general store, blacksmith shop, and post office. He also owned a hotel, bakery, and daguerreotype studio. According to a history of Buffalo County, “There seems no question that Mr. Johnson was a man of much more than ordinary abilities…” Among the newspapers Johnson had established several years earlier when he lived in Iowa were the Crescent City Oracle, the Council Bluffs Bugle, and possibly a second paper in Council Bluffs. Johnson also launched one of the first Nebraska newspapers, the Omaha Arrow. 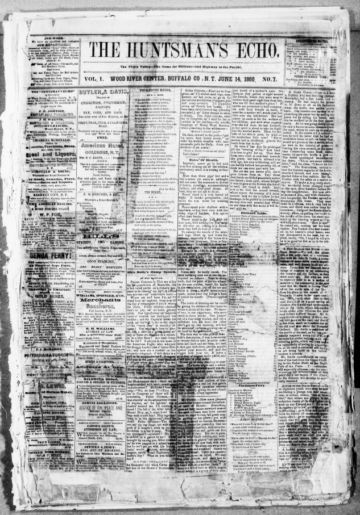 In August 1861, the last issue of the Huntsman’s Echo appeared, and Johnson and his family moved to Utah, where he eventually published the Farmer’s Oracle in Spring Lake; Our Dixie Times in St. George, which was later renamed the Rio Virgen Times, after the river running through the town; and a monthly periodical on pomology, the science of growing fruit.